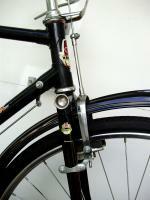 Bicycle Repair Forums - BikeRide › Maintenance & Repair › Brakes & Levers › Casual biker, need help. I'm from singapore and I'm a new biker, I don't know about those bicycle terms so please speak simply.. Thank you! Firstly, it's a problem about my bicycle brakes, when i always go out for outings and rent bicycle from rental shops, their bicycle's brake is always epic, when you squeeze it, the bike stops INSTANTLY, very powerful. However, with my new bike, when i squeeze the brakes, it always takes about 1-3 seconds to completely stop, it prefer stopping instantly. and yeah, it's a new bike so i don't think it's because of the brake being worn out. I tried approaching a local bike shop and they reluctantly replied me that there's no problem and it's already very good.. so my question is, how can i get the brakes to stop the bike instantly? do i need to adjust something or what? Secondly, it's some brakes squeaking problems, since i got that bike, it randomly squeak when i apply the brakes, it doesn't happen all the time, only randomly (on both wet and dry days). What can I do to stop the squeaking? Please help me with this 2 problems, thank you very much! I've taken a picture of my brakes, please take a look. Thanks painkiller , I kinda got distracted and did not finish lol. Yea i had to do quick camera work. I really like the blurry brake lever ha!